Spring time finally arrived a month late, nicely coinciding with the annual "spend the tax return on household repairs and renovations" time. This conjunction has severely limited productive hobby time but idle pondering while painting, wondering while weeding etc as well as reading and googling on extended lunch and coffee breaks have kept me working towards a Turkish army and rules to go with it. The problem came when I left the computer for a very thin section of the bookshelves, the Ottoman Turks. The more i think about it, the odder that is but there just doesn't seem to be that many useful books on the Ottoman army, especially during the 16th C when it was expanding so powerfully. Luckily several of the booklets I've had on the 18th/19th Century Ottomans included a fair amount on the early Turks, no doubt because they also had trouble finding things. A few years ago I eagerly bought a good solid book on the Jannisaries but it turned out to barely touch on military aspects and pretty much avoided anything about their campaigns. Anyway, eventually I remembered that I hadn't read Oman's chapters on the Ottomans for years and had usually rushed through them to get to "the good stuff". This is where I started to get into trouble. I read and reread the bits on the siege and on the Ottomans generally and then found myself rereading the Italian Wars stuff. OK, its related, and I have a bunch of suitable figures already. It was when I found myself plotting out figure requirements for Spanish Colunnas, I stopped. 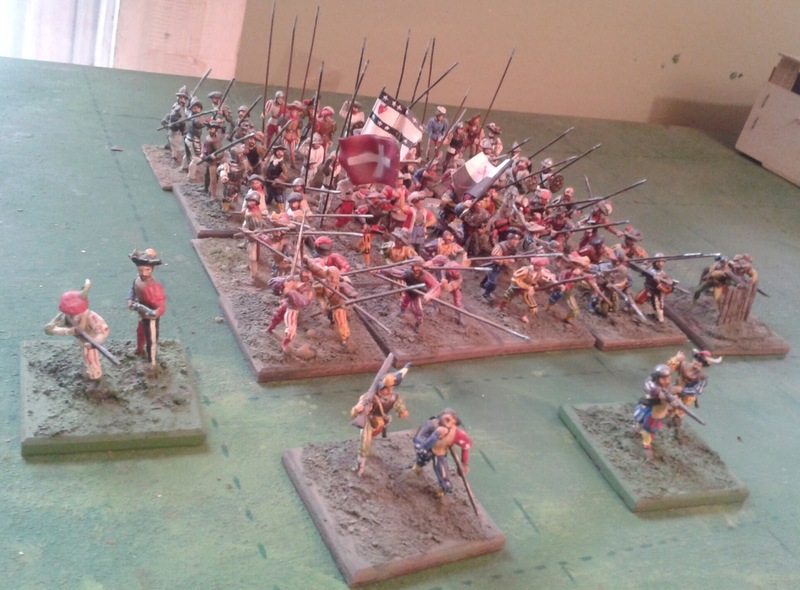 Not saying I won't do big chunks of the Italian Wars in 40mm skirmish, siege and the big battles, but not this year. Back to figuring numbers and organization for a Turkish army, not to/mention rules. I have various problems with each of the pike and shot rules I've read or played over the years, especially for 40mm figures for games ranging from a skirmish to a sortie to a pitched battle and committed to my current basing. More on that another day. In the meantime I have been reworking the prototype Azab. The original one had a bottom half that was too thick and puffy as well as a heavily bearded face that was too big, broad and flat. Its still not a great figure but its looking better. The beard will be replaced by a mustache since it seems to have been more common and its easier to add a beard from putty than to remove a cast on beard. After that two things are left to do, raise his arm and shoulder so that he is shooting upwards or deflecting hits from above while storming a fortress wall, and add a scimitar and better bow. There are various sieges throughout history that have been seen as pivotal events. One of these, now almost forgotten in the English speaking parts of the world at least, is the Great Siege of Vienna in 1529, the highwater mark of the Ottoman Empire. One expansion to my wargaming collecton that has been on hold for a few years is the addition of 16th Century Turkish forces. Rob has long wanted to put the 1565 Siege of Malta on the table and at Huzzah I suggested that it was time to resume discussions about it. So far, all of my 16thC forces are of the 1520 to 1550 era so while I am happy to bring any Turks I have to Malta, I want to stay with the earlier period for my own collection. Since Turks are back on the menu, I started reading what little I could find on the first Siege of Vienna. It soon became clear why Elastolin produced a range of Landsnechts and Turks without Turkish cavalry. They had produced what was needed for the great sorties and assaults of the Great Siege of Vienna. 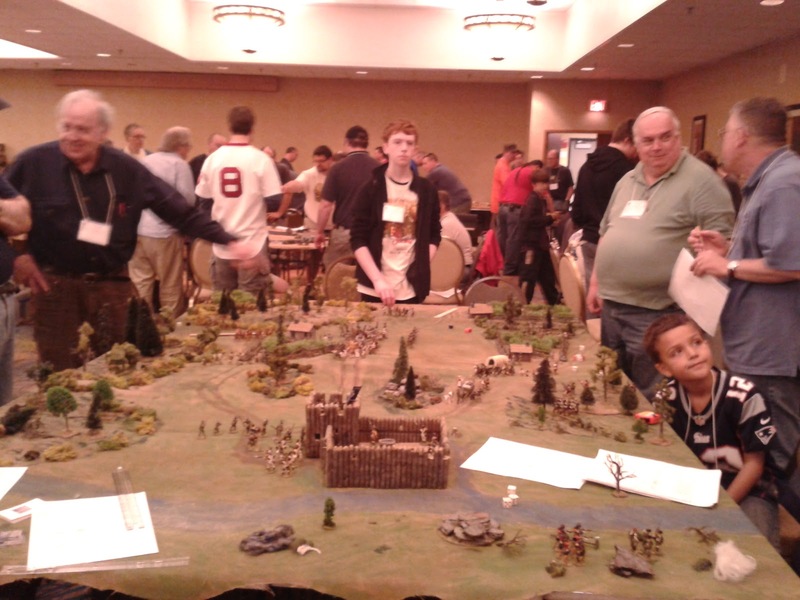 The 2nd Quarter (roughly) of the 16th Century is a fruitful period for wargames. Apart from the big events like Vienna, Pavia, Pinkie and Rhodes, there were many campaigns of raids and minor sieges where various parts of my existing collection could find employment in places like Italy, France, Scotland, the Mediterranan and in Hungary. It might be hard to find useful details of the Hungarian campaigns in English but luckily I am quite happy to make up imaginary castles to besiege. Another enjoyable Huzzah has come and gone. It was a typical excursion. This and that cropped up so I was 2 hours late getting underway but managed to pick up Gary and still join my sister and our niece for supper. Very convenient that they lie roughly 1/2 way. We spent the next day lounging about and lending a hand with a few of the never ending little jobs on the farm and were then joined by my brother and some friends for BBQ and conversation. The pork chops and sausages had been cute when on the cloven hoof last year but were particularly tasty this year. On Friday we hit the road again, arriving in Portland mid afternoon. We were expecting Rob Dean to be waiting but mother nature combined with what I see as typical airline efficiency to see him finally arrive about 7 hours later than anticipated with me waiting at the airport while he took the shuttle to the hotel. Ah well. All's well as ends well. Gary had preregistered for a game, viking raid or pirates can't remember now which was Friday night, but Rob and I just did the rounds checking out what was going on then got deep into discussing joint plans. Escorting Maid Marion past a notorious band of outlaws, or at least that was the plan. 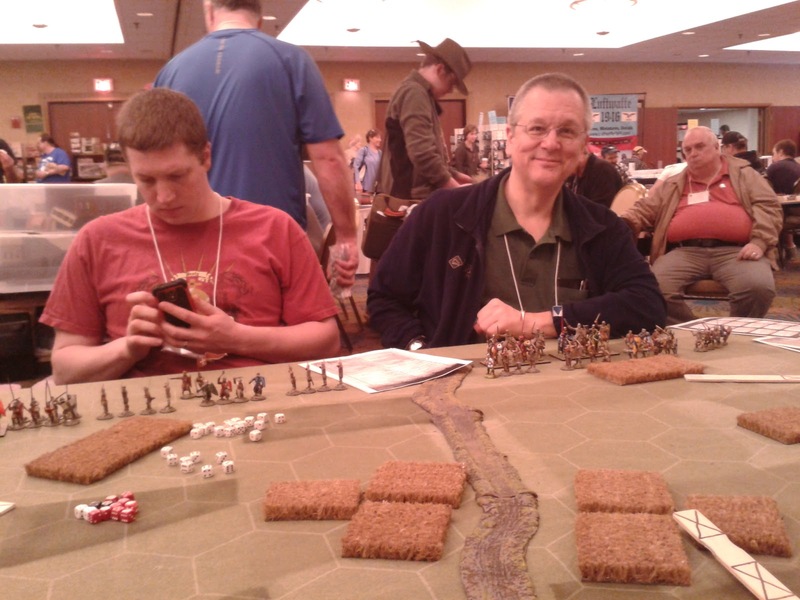 I had intended to not game on Saturday morning so that I would be rested for my game but my health being better than last year I accepted an invite from Chris Parker of Day of Battle to make up numbers in a Robin Hood skirmish using an unauthorized variant of Saga. I've been curious about Saga due to the buzz and enjoyed the game despite the 3 young fellows on our side (ok so I may have a few decades on the other young fellows) having our butts kicked by a pair of young women playing Robin Hood and Friar Tuck. I would have been even happier if I had suceeded in putting an end to Little John whose Merry Men gave me a fair amount of grief on my third of the table but alas when I finally managd to catch and thump him, he made a huge bundle of saving throws and got away. You`d think he was some legendary hero. More on my thoughts on Saga later but kudos to Chris for running some games that are fun for all. Pausing for a second it was a real pleasure over the course of the weekend to see such a wide range of ages, interests and game styles and a number of female gamers as well as the masses of male ones. There is hope for the future of the hobby yet. After a quick break for a bite and an eye break, I got setup for Drums Along the Mohawk. It turned out I did have the bigger table which was great. Since I had failed to get organized in time to stage a full multi-player test game in addition to the 2 player Google Hangout game on a 4x5 table, I was relying on past experience that it would all hang together with 8 players around a 9x6 table. The game involved 3 parties of settlers fleeing toward a fort for refuge after being alerted to the approach of Loyalist and Indian raiding parties. The settlers (rebel/ patriot depending on your POV) each had 2 wagons each with 4 combatants and several noncombatants and 2 companies of 8 veteran militia/iregulars as escorts. Apart from the garrison and an artillery piece the fort had a company of rifles and one of infantry that could sortie once a convoy could be seen to be in trouble. There were 4 raiding parties, all of 3 "companies" of 8. Two were of Western or Wild Indians, one was a mix of Tories and Mohawks that had been expelled from the Valley, the last was comprised of Royal Highland Emigrants, many also from the valley and some Germans sent down from Montreal. The wagons had about 6 feet to travel. The raiders each had an area of about 2 feet of wooded table edge to enter on but rolled to bring troops on with the odds improving until automatic arrival on turn 6. The Montreal column pressed the settlers hard and twice came within a hair's breadth of caturing the wagons Early on I regretted making the Grenadiers shock troops since it looked like they might over run the opposition with bayonet charge after bayonet charge without a pause for breath but while some ran, other farmers stood firm and shot straight, repulsing them and in the end the last surving grenadiers broke and ran. The jaegers were contained by the Rebel riflemen leaving the last 2 Highlanders to watch from a safe distance as the wagons rolled toward the fort. So much for the legendary luck of young gamers. Across the table both wagon trains converged on the center road choosing to face the tough climb rather than skirt the woods too closely. I was surprised that none of the Indians used their speed to cut them off but since they also came darn close to capturing all 4 of the wagons rather than just the one they did burn and managed to avoid the reinforcements, I can't say my plan was better. Chance was certainly smiling on the settlers who several times got the first move when they needed it and won or tied melees where they were at a disadvantage allowing the wagons to get a little closer to the fort and help. At the end of the day the fleeing settlers took heavy losses but 5 out of 6 wagons made it to safety with food for the winter and seeds for the spring planting. More importantly, I again had the pleasure of running a game with a great bunch of gamers, polite, fair minded, smart, companionable and every thing a GM could wish for. It was especially good to see some familiar faces, I hope to see some of them again next year. My undisciplined, low morale levies and Nobles try their best to look like Hussars and trained infantry. Saturday evening I managed to squeek into a game of Fire and Sword. This is another set of rules that I had wanted to check out but more than that Sienkewitz's (sp?) Trilogy has been one of my favorite works of literature and Pan Zagloba and Pan Yan heroes since I was introduced to With Fire and Sword by a Classics Illustrated Comic when I was knee high to something. 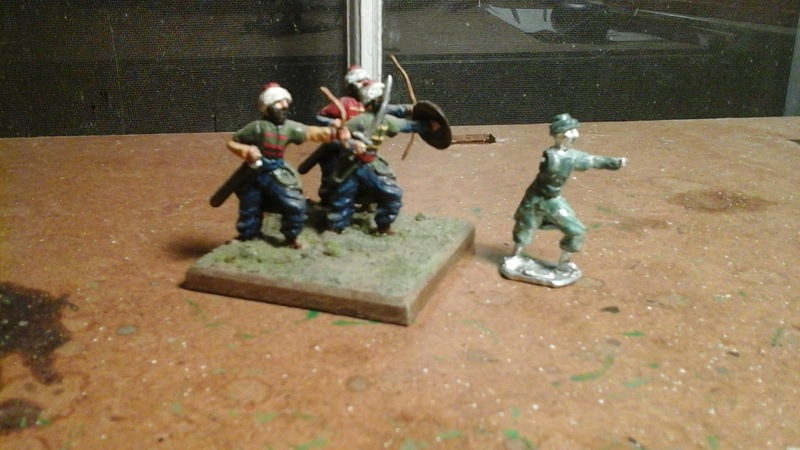 Minifig Winged Hussars were amongst my first metal wargame figures. 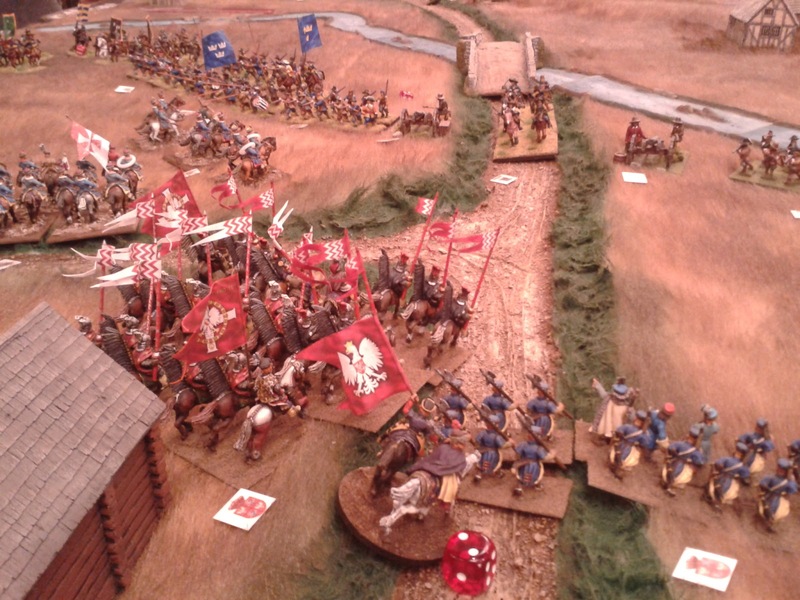 The game was a fantastic spectacle with tons of colourful troops on wonderful terrain but there are much better photos on the web than any that I took with my smart phone. (Mind you I'm pretty happy with what I took. Really must add more light to my room. ) Check out the link below. The rules were fine with a lot of conventional, well proven mechanics along with a few new twists. In many ways a classic OS approach where you just pretend you are commanding real troops, I'd happily play them again but doubt that I would buy a copy unless I didn't want to write my own. Over all it was an enjoyable evening of gaming with a great bunch of guys. Thanks and Kudos to the group that built and tested the game. I'll keep an eye out for what they do next year. I hadn't preregistered for any games on Sunday but Rob (on the right above. I am embarrassed to have to admit despite having played one game beside and another across from him plus both participating in a round table, I am having a mental block on the other chap's name despite his being a good gamer and pleasant companion.) and I were able to grab spots on opposing sides in another medieval Saga variant (unauthorised) game, 100 Years War this time. It was an enjoyable way to wind up the con. I can see why the rules are so popular but like many popular games while I'd be happy to play a game if invited, it would be just a social event and I have no interest in getting "into" them. The dice and battle board mechanism makes for an interesting game within a game, like managing a hand of Memoir cards. However, like many fashionable rulesets of this century, it seems to me that it gets players making choices that often result in their units taking appropriate action with reasonable results but it distorts the players view of what is happening or what a commander would be thinking. The player chooses to use his dice to maximize the effect of his longbowmen because its the most efficient use of the dice he rolled compared to his board. Its a very narrow and somewhat arbitrary distinction between mindsets and I don't think I have quite expressed exactly what I meant but its not really important and its late. Perhaps a discussion for another day. Anyway, I am home from the 2,000 km round trip and fired up to get cracking at various things such as getting a "final" solution for my gaming room that will allow a slightly bigger table with temporary expansion capability, getting a workshop set up to finally get my spin caster into action and getting a lot more sculpting done and improving myself, not to mention a bunch of painting and playing of games. In the meantime please use the following links to spend some time browsing pictures of all the things I didn't photograph. Well, here I am, leaving in the morning on my Huzzah roadtrip. There was some last minute scrambling when I found out that my game might be on a 6x9 ft table rather than the 5x7 I had planned for. (Yes thats roughly 50% more terrrain and maneuver room with no increase in figures or time.) All sorted now so that I can do either but amongst other things, my blogging time suffered. So here is the 30 second summary of the rest of the game. At least google didn't shut me out of my log like they did the Steadfast Tin Soldier. For those like me who enjoy Tony's blog and for those who haven't yet discovered it, it can now be found at http://tonystoysoldiers.blogspot.ca . Back to the game. While the Red Queen's cavalry was hammering at the Oberhilse Field Force, the rest of the Blue infantry was crossing farther downstream, right in front of the artillery. By the time Blue decided that the guns would have been much better employed on the far right flank, there was not enough time, space or orders available. In one of those odd quirks that make one wonder, the harder the Blue bridgehead was pounded, the worse the order dice got so that some of the Volunteers were lined up by the boats but effectively refusing to get in! Queenston Heights all over again! While they wavered, the Blue Guards and Green Tigers hammered each other. The Tigers blinked first after their Brigadier went down but the mere colour party of the Guards that was left had to be pulled out of the line anyway. With the arrival of Red's 3rd column their attacks intensified. The Zouaves were finally worn down by a concentrated barrage and despite being reinforced by the remnant of the Guards, were driven out by a bayonet charge of the Royal Veterans. New cavalry regiments threw them selves onto the mass of Blue infantry in the center to pin them while the Royal Fusiliers drove back the handful of the 1st Infantry that was all that was left of the O.F.F or Zinn's Brigade. Suddenly it was over and what was left of the Blue army on Red's shore were rushing for the boats. (Army morale level was reached). Any other comment will have to wait I have a wargame to attend to roughly 1,000 km and 1 country south of here. "Now the Hurley Burley's done"
This game would have been an excellent candidate for a Newport Noodle article but the iron is no longer hot and I have had too much to do. Quite apart from taking advantage of Goldilocks weather before I go away, I am in the final stages of preparing the AWI game for Huzzah. Rebasing, a few extra figures painted, Quick Reference sheets and Chance Cards all done and packed. I just have to do my ground cloth and some briefing notes and of course pack incidentals like clothes and passport. Only 2 days and a wake up till departure. So what follows has been typed in short spurts over 3 or 4 days and may be a bit more disjointed than intended. 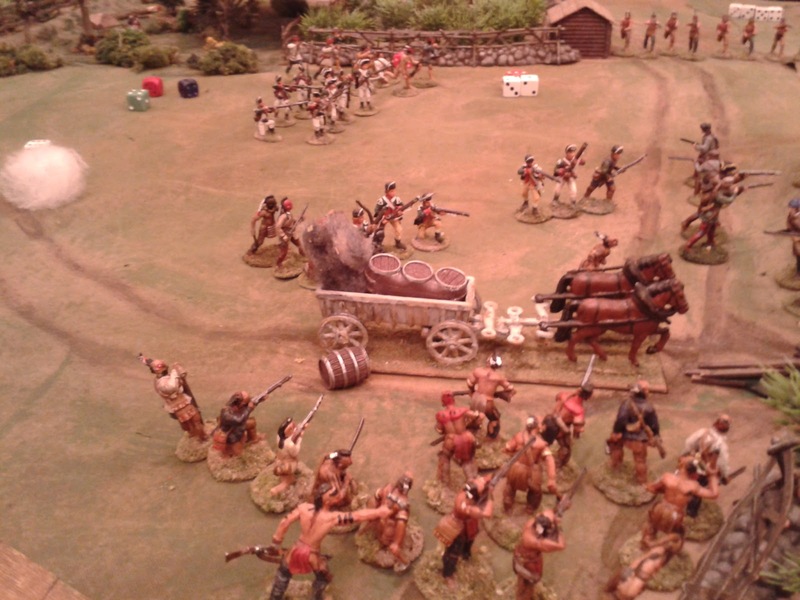 Princess Charlotte's Dragoons ride over yet another Oberhilse square, taking a stand of colours. The scenario was River Crossing from CS Grant's Scenarios for Wargames, the one which appears on the cover (at least on the original). Briefly the attacker, Blue or Republic of Oberhilse in this case, have seized a toe hold across the river and are using commandeered boats to pass reinforcements over at the rate of 1 unit every 2 turns. The defending Red or Kingdom of Faraway troops are rushing in 3 columns to throw back the invader. Once all troops are in play the number of units on each side are roughly equal but the composition varies with Oberhilse having an advantage in infantry and Faraway in cavalry. The infantry units I used were variously raised as 3 or 4 x 8 man companies for MacDuff, as 20 men (5x4) for Morschauser Meets MacDuff or 16 man units so I went with the Lowest Common Denominator and fielded 16 infantry, 8 cavalry or 1 gun with 4 crew as game units. Since I have been stalled for several/years while I tried to/decided what to/do, there was a mish mash of War of 1812, 1840's and 1860's units and generals. The look and feel of the game was such that I can hardly wait to get back and set about getting the troops properly organized at last into coherent units on a standard basing scheme, 20 infantry, 12 cavalry divided into 2 squadrons and 1 gun batteries with named brigadiers and generals, and all the trimmings. There is a strong possibility, not yet confirmed that the 1812 troops will be reorganized into 8 man "Square 1812 Brigadier" units so that I only need to add a handful of figures to be able to play quick 1812 battles when the need arises and can focus my painting, playing, and campaigning on the Atlantica project. The alternate plan will be to keep the armies compatible and not worry about finishing the 1812 armies for now. The 2nd Column arrives complete with scatter die equipped Rocket Battery. Faced by two batteries and the fire of the troops in the town and wood, Red shifted left and began a long attack by skirmishers and artillery on the town, hoping to wear down the defenders while waiting for reinforcements. The cavalry shifted to the far left and looked for an opportunity to intervene. This continued while Blue built up forces in his bridgehead and red waited for reinforcements. An advance by Blue units seemed to both threaten to expand the bridgehead and offer an opening so the lancers were sent in. They were repulsed by a hasty square but when Red's 2nd column arrived the Dragoons were sent in to try. Confident now of their rifle fire the 3rd Infantry took the charge in line but were almost over run. 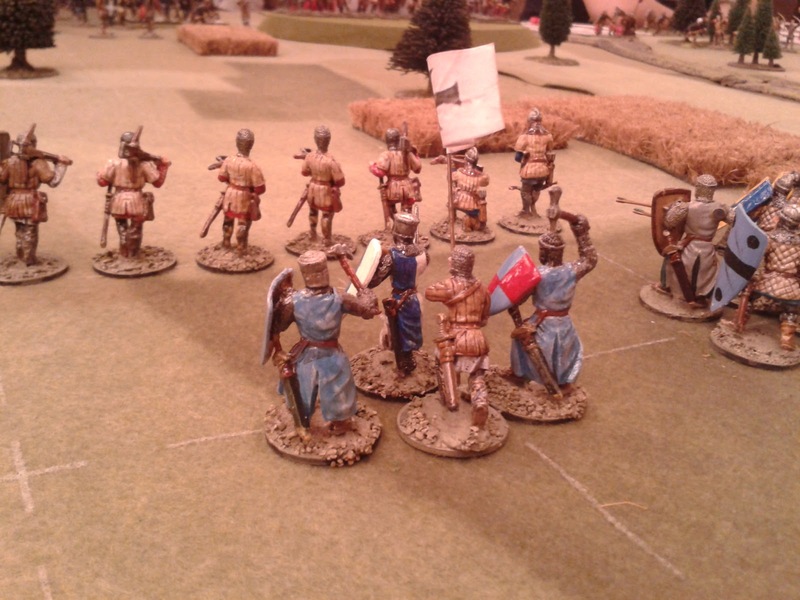 They quickly tried to form square during the ensuing melee but were too late (and very unlucky in the 2nd round of melee and following morale test). The square was broken and the remnants scattered, leaving their colours behind. As the fighting spread, it dawned on Red that his cavalry was not going to fare better once Blue was established and that by the time enemy cavalry arrived for a proper fight, it might be too late. He shifted the horsemen left and sent the newly arrived Larsen's Lancers to join them. Charge after charge was sent in. One catching the 2nd infantry as they made room for the 1st Infantry (becoming known as the Old Guard). The 2nd was also broken but managed to save their colours. (That`s not actually in the rules I just diced for it like capturing a General). The 1st infantry was hammered again and again but finally saw off the last of their tormentors and retreated only 5 strong behind the town. 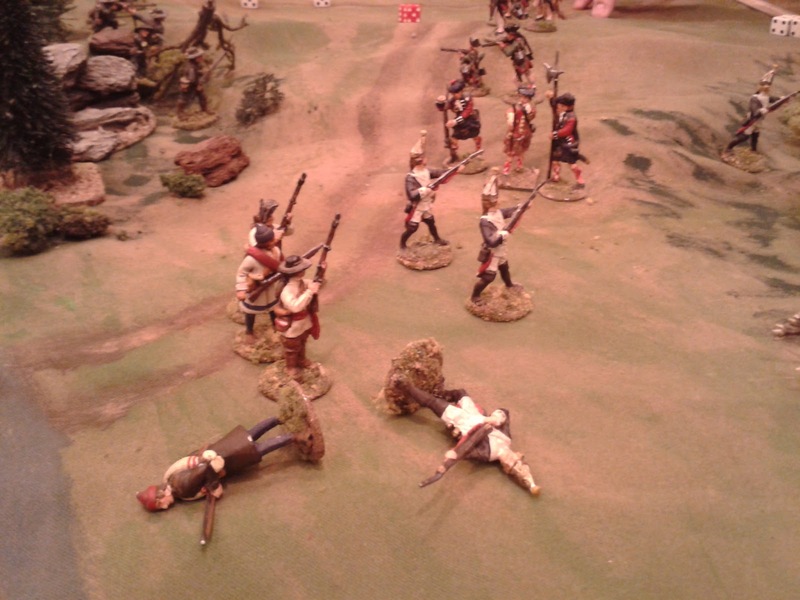 The 1st Infantry begins its ordeal as Brigadier Zinn takes yet another wound. This current Hearts of Tin game is one of my longest. I did finally end it this evening on or about the 18th turn after 5 days of sneaking in turns, 1 here, 2 there. Interestingly the game remained enticing and enjoyable and in the balance right to the end. There's been an almost unprecedented run of things like an entire day without rain, a broken kitchen drain for me to replace and umh 2 naval games at Ron's. 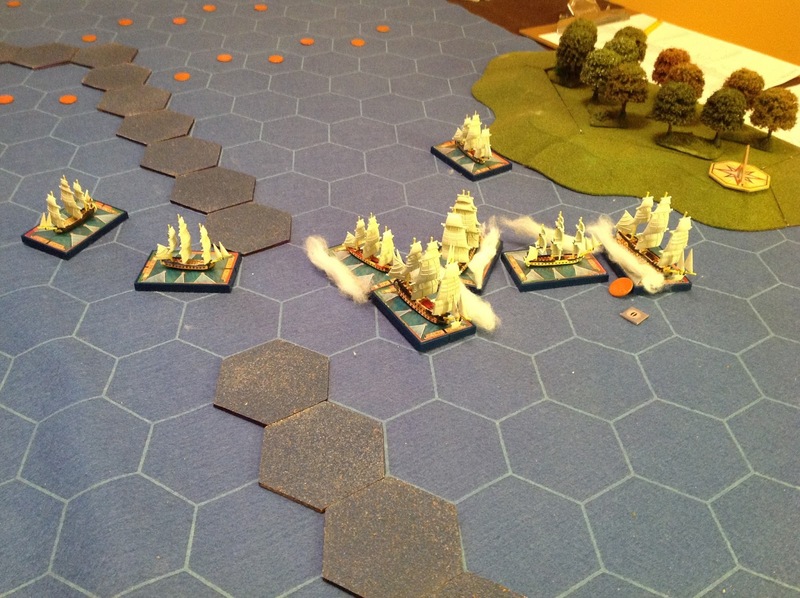 The merchantmen in the foreground are 2d printed cutouts. 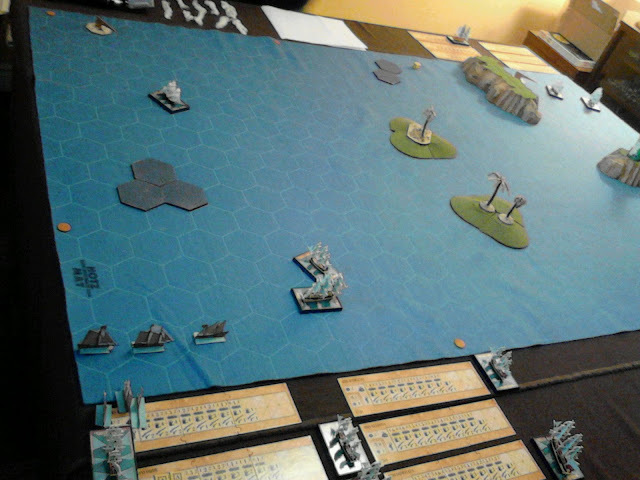 Last Friday I got to try his latest effort, a very effective kluge of Sails of Glory and Wooden Ships to allow us to use the beautiful ships and easy combat system on his hex mat. 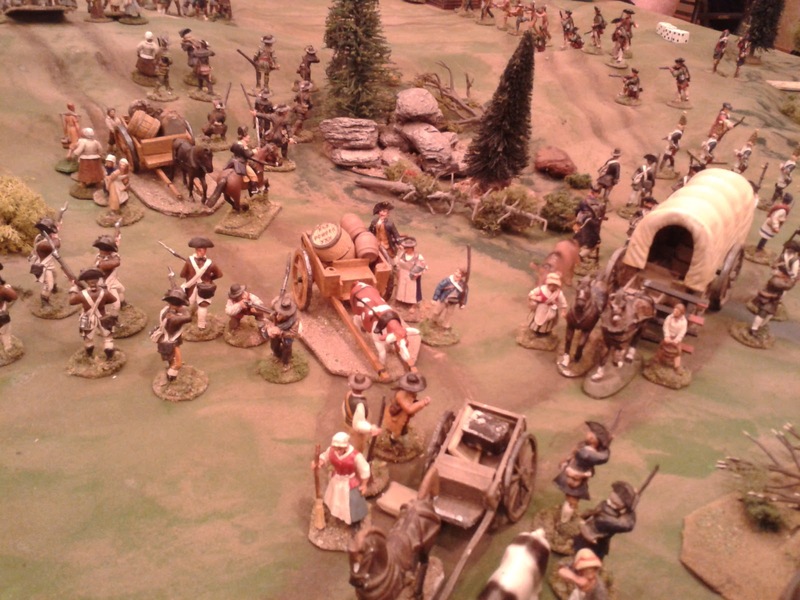 The scenario was the wagon train from CS Grant's Scenarios for Wargames translated to a naval convoy situation. I drew the French fleet trying to get a vonvoy through. The game was proof that you can lose a game decisively and still have fun. This game was Two Sides of a River from Programmed Scenarios with shoals substituting for the river, inspired by 1 of Cochrane's exploits iir. My outgunned and split RN squadron was tasked with preventing the French from getting through in force. I lost a frigate but took a ship of the line and sank a frigate. That left me with a ship and 2 frigates chasing 1 and 1 as they left the strait. The victory conditions were a bit vague as to what constituted an effective force on his part but my force was certainly not destroyed so we called it a draw. Great game though, tense up to the end. Hopefully tomorrow I will get pictures of the Atlantica game uploaded and Part 1 written up. Turn 2. 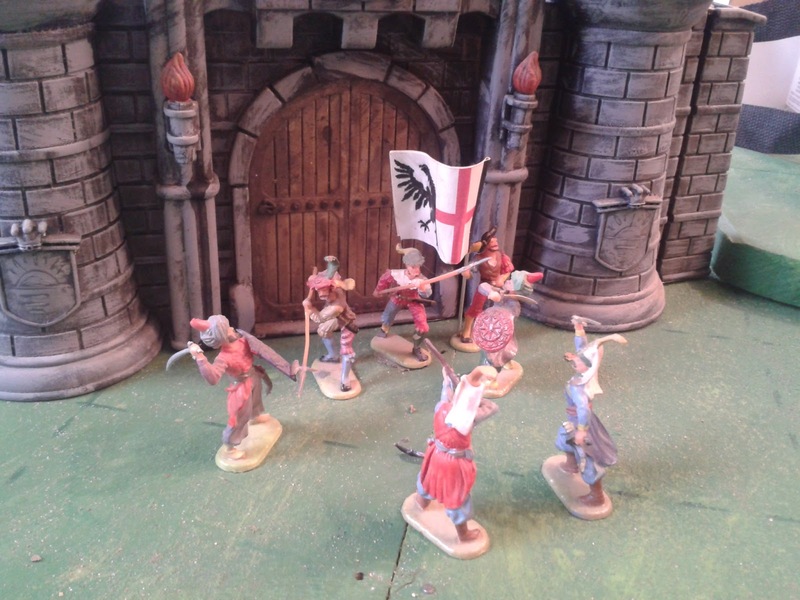 The Queen's troops begin to deploy. While the original units for this project were done using the 20/10 plan, many of the later were ones were done at 16/8 and will need upgrading. Luckily I have the figures I need to bring them all up to scratch. Having decided not to start again from scratch I have now gone through, got things updated with serious changes but without totally upsetting the original apple cart and the Hearts of Tin (HofT) rules are again available for download and comment, use etc. During the process of reviewing various choices of mechanism and testing them on the table, I was reminded that in my first take at a Morchauser inspired set back in 2003, I included a number of not very Morschauser like aspects along with some concepts drawn directly from his rules, such as the 3" melee range which separated shooting which was not necessarily decisive with melee which always ended with 1 side or both being destroyed. The current rules again show inspiration drawn from Morschauser as well as Featherstone and Lawford & Young and are probably the best illustration yet of the sort of thing comes into my mind when some one says "wargame". Not saying that I don't enjoy gridded or abstract or clever or other games or that this is better than anything else, but like Charge!, this feels natural to me. Of course now I can think of 1/2 dozen better ideas for MacDuff but its too late the change the game before Huzzah and keeping in mind my desire to reduce the breadth of my collecting and solo playing, I am officially retiring MacDuff after Huzzah. He has had his day. HofT no longer deals with the 18thC at all and after quashing an urge to do an 18th C version I have decided to stick with 1 set of 18thC rules: Charge!. More on that and the AWI and the 1775 Quebec campaign another time. Meanwhile, here are some of the Bugbears that I have wrestled with over and over when trying to get Hearts of Tin (and MacDuff) working the way I want. 1. Extreme Events. These are the famous, rare things, like the British Guards supposedly routing the French Guards at Fontenoy with a single volley, the breaking of squares by cavalry, the panic of the Spanish right at Talevera by mistake. Ideally such things should be Rare but Possible. In a simple game that tends to become either Common or Not Possible. I cheated a bit with this one by narrowing the scope to the period 1812 to 1865 outside Europe, the one I am most interested, which coincidentally seems to have fewer of such things (or perhaps just that I haven't come across them) so I was able to largely avoid them. 2. Cover and other modifiers. Saving throws, die score modifiers, number of dice modifiers, casualty modifiers, tables, I've tried them all. They all have something to recommend them and something against them. They key is to give players a reason to take steps to reduce their troop's vulnerability, (occupying cover, dispersed order etc) while still making it worth while shooting at them. The 2 main methods are essentially to reduce the odds of a hit or to reduce the effects of the hits. Ideally they all give the same result on average but in practice some can result in extremes either way while the same is unfortunately true in history making issues with the more predictable methods. The trick is to allow defensive extremes without making them too common. Off and on over the last 20 years my favorite method has been to use 1/2 casualties with no casualties being guaranteed. My only beef has been what to do with any fractions. My solution this time has been to leave it up to players, round them up, round them down, dice for them, carry them over. Do it differently each game. Just decide at the start and apply the same rule to every one. The result is that while your fire may be completely ineffective, it will more likely slowly wear them down. Withe the best dice in the world though, the cover will always benefit the defender. 3. More is easier. The main reason that I like slightly larger units isn't the look of them (that's No 2). Its because each hit is less critical. If a unit can absorb 20 hits it doesn't matter so much if it occasionally takes more than they "should", they will survive. But more needs more table space or smaller figures or at least a smaller footprint per figure. This has been at the heart of my basing dilemma over the last 5 years. The new 2 man bases are proving them selves wonderfully on the table. They give me the flexibility to skirmish and fit around terrain or mass in close order, allow me to remove casualties from the rear rank so that units get weaker instead of smaller until they regroup, are as stable and flexible as the wide ugly washers but are as compact as the 6 man bases I tried in 2009. So I can use my 20 man units on a table that will fit in my room. 4. Morale. I hate morale tests. They are hard to resist though as automatic results such as 1/2 strength = remove from table always seem to end up leaving historical situations violated (though see #1, extreme results, would Camerone be famous if fighting to the last man was common?). Simple morale tests though have the same extreme dangers as in 2. Units that fight to the last man too often or Guards that rout off table after being hit by a stray shot. One way I have tried to work around it have included things like ways to recover hits so a fixed break point wasn't a one way, inevitable end point. Once again larger units give a designer more room to wriggle in, you are less likely to lose all of a 12 man cavalry unit to one extremely lucky blast of long range small arms fire than you are a 4 man one. But its not just when units are removed from the table, its about units becoming ineffective without leaving the table which seems to have been the most common result historically. (To be fair re the 1/2 strength rule, while many of us remove Charge! units when they drop to half, they are technically just required to retire and have their capabilities severely cut). Its also about players not getting the same result from long range pot shots over time as from a decisive attack. My current scheme is a variation on one I have used before. There is no automatic rout, units may fight to the last because losses include stragglers and soldiers still with the ranks but no longer fighting effectively which is why I like to maintain the frontage so that if attacked by a fresh unit, the worn one will have fewer dice spread over the same frontage. To allow easy morale distinction between the slow drain of long range fire vs the destructive moral effect of close range firefights I have reintroduced the old 3" "melee" zone. After a round of melee (which is mostly close range shooting but also includes charges into contact), instead of the automatic loss, I have included, yes, a morale test with a modifier for quality and for how badly you lost. The result is that a unit, especially an elite one could lose every round and still fight to the finish as long as they don't lose any 1 round too badly. Its not likely though. It is more likely that a unit that loses a round of the decisive close combat will retreat and might rout if it loses badly or has low morale. Hopefully this variation, the best yet, will work as well as some test tuns predict. So there I was, trying again to get an existing set of toy soldier horse and musket rules to more accurately reflect my intentions. The basics are easy and habitual and I can scratch a playable quick reference on a scrap of paper in 3 minutes but beyond that, things nearly always tend to bog down quickly and then head for the ditch. Once again it seemed to me that if I could just figure out how to turn the horse around and have it pull the cart things would be easier. A short list of wants and goals seemed like a good starting point. A. The rules should be as simple and as easy to remember as possible. To aid this, current, successful, mechanisms which are already in my head should be used in preference to trying out new ideas. B. I should be able to use them to game small historical actions, in scale, with an acceptable (subjective) level of historical believability and feel including the amount of ground covered, number of attacks made over the course of the battle, etc. C. Despite B I want basic units of around 20 infantry, 10 cavalry and a gun with around 4 crew. The scale will have to work around this. D. I want a typical game to have between 6 and 18 units per player. E. While this is to be a stand alone game I want it to use as many common mechanisms as possible with the Square Brigadier and Gathering of Hosts as possible without subverting either rules. This is to make it easier to move between them. G. The rules are for me to play early and mid 19thC Horse and Musket games using an existing and soon to be expanding collection of 40mm figures. I am always pleased when someone is interested enough to try them out but I have spoiled several working rulesets try to anticipate what I or some other, unknown, person might think or want in the future. H. I want the rules to visibly reflect the tactics used without getting fussy about the process or forcing the player to be Captsin and Colonel as well as General. Right, that's probably too many things but I have the badics sketched out on paper as a sort of quick reference so I'll get back to playing and post a 1 page , Coles Notes version later. This time I intend to go back to including as many of tge explanations and dedign notes into the text as I can so the full document will be a while. I should probably find a new name but I like Hearts of Tin as a name fir a game aimed st glossy 40mm Toy Soldiers and having gone back to reread the original 2010 the basic concepts are still the same even though the details have changed.